Taking Inventory » Blog Archive » June 2009 Update! There’s not been an update here for months, and I am sure for some people it’s been a little weird. I had promised there wouldn’t be gaps like this, but then this gap happened. So, I figure let’s just put it all out here and let people know what’s up, instead of leaving things open to speculation and concern. First of all, let’s be clear: this project is alive, and is continuing, and will be finished. If you had any worries along those lines, please don’t have them. The reason things have been delayed is one of simple reality: my day job, which funds my existence and the production, went from being somewhere in the realm of what a work week should be to something that we’ll diplomatically call “demanding”. It became harder to be able to put this work aside at night and work on editing the movie, which asks for a certain frame of mind. I was able to do repetitive or low-mental-level tasks, like scanning and sorting, but going through footage and finding links to compare side by side, and planning the arrangement of sequences was something I was only able to work on every few days or once a in a couple of weeks. It slowed things down dramatically. I have recently recalibrated my life so that I can work harder on the editing of the film and the rest of the production and move forward more quickly. There’s a great movie here! I’m enjoying editing it again, and watching all these recorded interviews, split as they were across years, connect and form ideas, is always a thrill. Now I just need to finish it. As a parting gift, let me share an artifact that is both old and new. 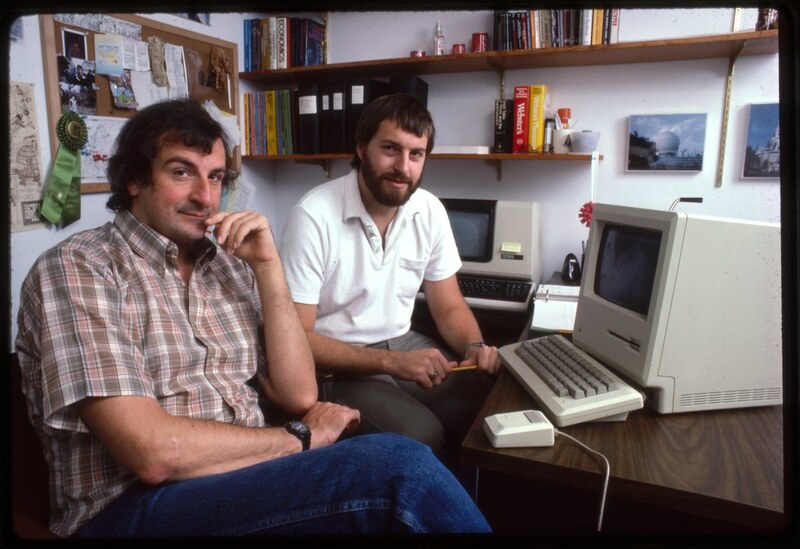 As part of the promotion for the Infocom game Hitchhiker’s Guide to the Galaxy, a PR photograph was taken of the two primary authors, Steve Meretzky and SF author Douglas Adams. This photo showed up in a variety of computer magazines and publications and for people who know the game from the time it came out, they probably ran up against this photo in one form or another. I have had the opportunity to scan an original slide of this photograph, and do so at a ludicrous DPI setting, and so I present you this photo at the largest resolution and quality it ever has before. The Macintosh is simply placed in the photo to give a “computer” look to the shot (Douglas Adams was a big fan of the Mac, which had very recently come out). The real development work would have been done on the Digital VT terminal behind Meretzky’s left shoulder, which would be hooked up to the mainframe that held the ZIL environment that Infocom games would be written in. This is Steve Meretzky’s office at Infocom at the time – family photos are on the bulletin board. Not as obvious is that these are two very tall men: Douglas Adams was 6’5″ and Meretzky is comparable. Thanks again for your patience, and I hope to have more frequent updates in the future. I wish you could have assistants… As it is, I salute your continuing effort and commitment! I know how it is to keep people waiting for the completion of a daunting task (a big novel, in my case). Good things are worth the wait. Take your time — we’ll still be here. Glad to hear that you are moving forward. This is a fantastic project and I am eager to see the results. Keep up the good work! That was a relief! Glad to hear Get Lamp hasn’t been abandoned yet. Oh, and we must abolish work. No, really. But if your enthusiasm ever needs some pep – we’ll be here too! Stumbled upon your site/and the film in the making ages ago, so long ago I can’t remember where. But being a huge text adventure fan from back when, added it to my faves and have kept an eye on the progress ever since. Terrific to know all is still going, and I find your energy on the project and dedication to it inspiring-as well as eagerly awaiting the film. Good on ya, all the best! If I could see no other film this year, I’d want this to be the one that I saw. More power to your editing arm, I wish I could help you! I must say Jason, you’ve officially perpetrated the worlds longest *tease* in this history of man kind. Hire some young gun film student intern who get’s your vision and be done with it man! (Just kidding, keep up the hard work, looking forward to “early 2009″ – whenever that happens to arrive). Great, man! Can’t wait to watch it. I know the feeling of having a lengthy personal project lag at some point. I did an 8-part photo story in the Doctor Who universe using 12″ GI Joe and other figures. I figured it would take 8 months. One month per chapter. Two and a half years later it was finally finished. I will say that while it took a lot longer (and for most of the same reasons you cite) the final result was above and beyond my expectations, and the reader reviews were awesome. It was worth the extra time.